A New Book on Self-Determination Theory by Ryan & Deci has been released. 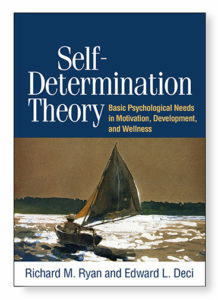 The Selfdeterminationtheory.Org Homepage offers an initial discount here! Self-determination theory (SDT) provides a framework for understanding the factors that promote motivation and healthy psychological and behavioral functioning. In this authoritative work, the codevelopers of the theory comprehensively examine SDT’s conceptual underpinnings (including its six mini-theories), empirical evidence base, and practical applications across the lifespan. The volume synthesizes a vast body of research on how supporting—or thwarting—people’s basic needs for competence, relatedness, and autonomy affects their development and well-being. Chapters cover implications for practice and policy in education, health care, psychotherapy, sport, and the workplace.